Today E-cart business is expanding and with such expansion in online business, there is platform offered for the people who want to develop their own website and get open source domain either from Volusion and Shopify. 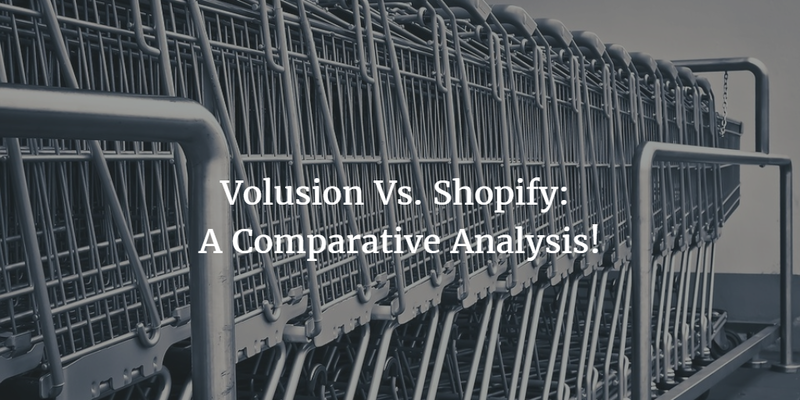 The shopping cart business has tough competition in the market whether you choose the Volusion or Shopify. Here is the comparison between both of the platforms for E-cart shopping. The theme of the Shopify is way to modern and updated, they have very professional themes and give the customer idea of trustworthy business theme, sometimes you do online shopping but when you see the interface of the web page you feel little unsure about either it is real or fake, so with Shopify you won’t have that feeling. You can also start your business with the free theme once you earn a good profit then you switch to the professional themes of Shopify and purchase it. The Volusion theme is a 360th-degree theme, they are a broad range of theme available and you can select accordingly as to your business theme matches. Some of them are free of cost for the best of the theme you have to purchase it. There currently more than 87 free themes available on Volusion and few of the are locked you can purchase that one. If you thinking about the cost and revenue you can earn after buying the Shopify than it 98% not bad, the reason behind this is the Shopify is not much clear about the transaction fees option that’s why sometimes customer got confused and then don’t purchase. The reason why much business chooses the Volusion over Shopify is that the cost is less and even the transaction option is easy for the customer so the revenue from this is 100%. The customer experience on Shopify in 99%, many of the customer seems to satisfy one performing shopping over Shopify platform. It can be 100% if they improve their transaction section. Whereas the customer experience at Volusion is 100%, majority customer reported that they feel secure and satisfied with the service ove4r shopping the Volusion cart. Running an online business can be difficult and you can face different problems just like in case your web page is not accessing from the customer side or your member customer cannot sign in to their account for shopping. The Shopify support is available 24/7 on the live call, Email, and Chat. They also have a forum for user interaction where all of the users can discuss their problems and they have already put some solution on their forum. The Volusion platform also provides the 24/7 user service support, but the thing in which they lack where Shopify is great that they don’t have the online forum for their user. They should have it many of the users have suggested that they shall update the Volusion with an online forum for their users. Both of the e-card solutions gives the customization option to their users, the user can manage, design and develop the website on the platform and choose the template of their own interest, which is an added advantage of both platforms. Anna Marsh is working as a web page for Essay writing service firm. She is extremely passionate about her work and always loves to share her guidance with others. Furthermore, she is an important part of an Educational firm which is one of the most followed academic consultancies in the UK. When not working, she likes to read fictional novels.